Knowing that equal amounts of effort or inputs will not generate the same amount of outputs. More generally, the Pareto Principle is the observation (not law) that most things in life (effort, rewards and outputs) are not distributed evenly. The Principle was created by an Italian economist, Vilfredo Pareto, in the early 20th Century based on his observation that 20 percent of people in his country owned 80 percent of the wealth (income and land resources). Pareto developed a mathematical formula to represent this unequal distribution of wealth across the population. Dr Juran inaccurately attributed the 80/20 idea to Pareto’s mathematical formula in the mid 19th century and thereafter Pareto’s observation became known as the 80/20 principle. 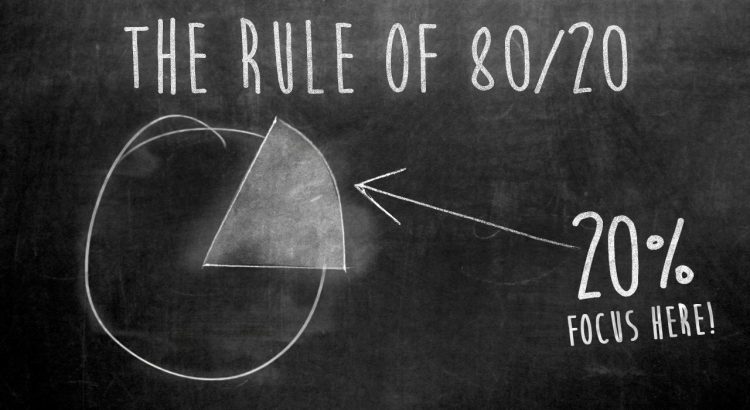 The 80/20 Rule means that in anything a few (20 percent) are vital and the many (80 percent) are trivial. Or applied in other ways: Only a few causes that lead to a problem are responsible for the bulk of the problem. Or 80% of the outputs result from 20% of the inputs. While the principle can be applied from management sciences to the physical sciences, the principle has mostly been applied in manufacturing, administration, marketing and project management. 20% of workers contribute 80% of results: Focus on rewarding those employees. 20% of customers contribute 80% of revenue: Focus on satisfying those customers. 80% of the yield reduction is caused by two major plant pests: so target extension programs on these two major pest plants rather than all pest plants in the farming system. 20% of farmers participating in an extension activity will be self-motivated to implement the knowledge and information presented; so an extension practitioner might want to think about a suite of incentives to motivate the other 80%. The point is to realise that you can often best focus your effort on the 20% that makes a difference; instead of the 80% that don’t add much value. This means that if you have a list of ten items to do, two of those items will turn out to be worth as much or more than the other eight items put together. In reality, the distribution can obviously be different from an 80 to 20 joint ratio, however the principle holds; that the minority of the inputs will lead to the majority of the effects. This is referred to as focussing on the “vital few”, as opposed to the “trivial many”. Have used this principle to good effect for years, I didn’t know it had a name. It certainly serves to keep managers happy.